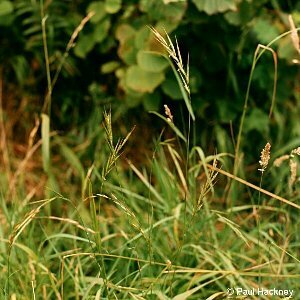 A rare species of grass which resembles wood-brome (Brachypodium pinnatum) but with tighter, upright, curved spikes of flowers. Known only from four sites in Co. Fermanagh and Co. Antrim. Three of these are from railway cuttings, but a site near Garron Tower is in marginal dry grassland. The plant may be a recent arrival in the north, being mostly a southern species, and it is perhaps significant that three of the sites are associated with railway lines. The Co. Fermanagh sites have not been confirmed since 1953. All names: Brachypodium pinnatum (L.) P.Beauv.